Upgrade your style routine with new Fructis Style Pomade, Putty and Cream that come in liquid-formats. 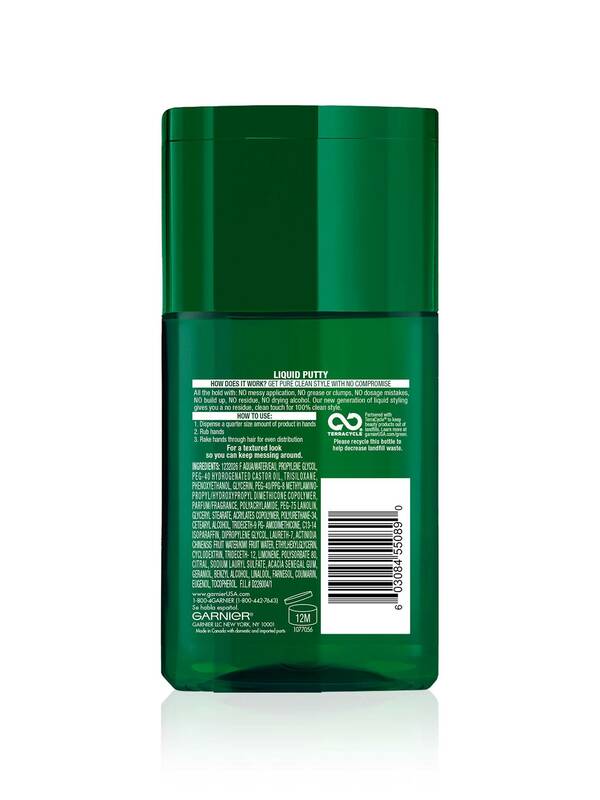 Fructis Style Matte and Messy Liquid Hair Putty for Men is a liquid-format hair putty that gives you a textured look and medium hold. 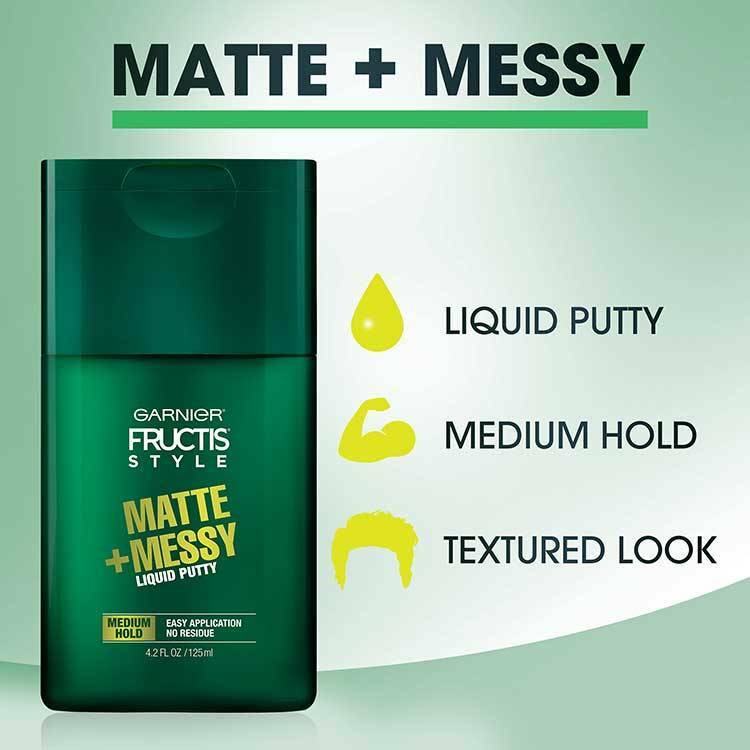 Fructis Style Matte and Messy Liquid Hair Putty for Men makes application easier than ever, and gives you a no residue, clean touch for 100% clean style for an upgraded routine. 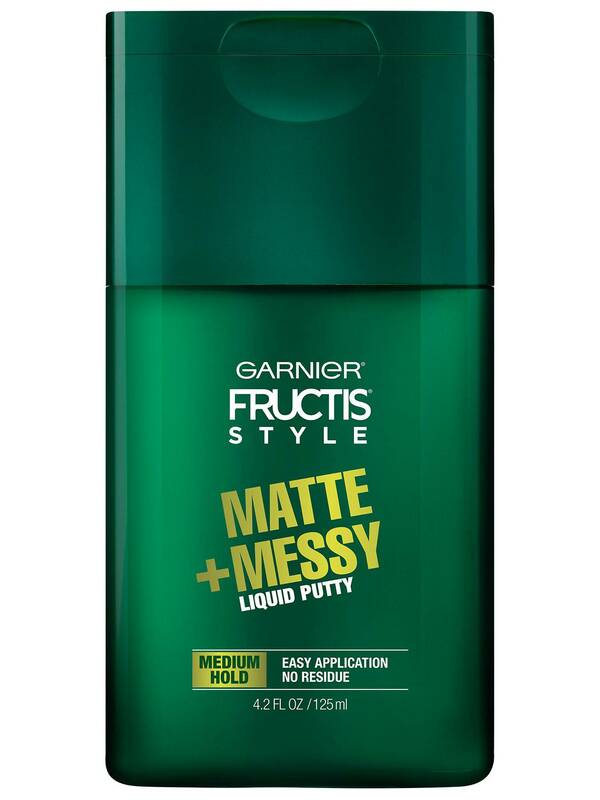 Garnier Fructis Style Matte and Messy Liquid Putty for Men gives you all the hold with no messy application, no grease or clumps, no dosage mistakes, no build up, no residue, and no drying alcohol. Upgrade your routine with Fructis Style Pomade, Cream and Putty that come in liquid-formats. For best results use on damp or dry hair after shampooing with Fructis Grow Strong Cooling 2-in-1 for Men. Dispense a quarter size amount of Fructis Style Matte and Messy Liquid Putty for Men in hands, rub hands together, then rake hands through hair for an even application and a textured look. Rated 4 out of 5 by netanelrm from This clean is amazing for my skin I use it every day and make your skin fresh and hydrated. Everything on in is good. Rated 5 out of 5 by victoriajacques23d5f from I originally purchases for myself but ended up having my whole family use it as well since they really liked it. I would totally recommend to anybody long or short hair! Rated 3 out of 5 by MelvinSmiley from Good styling product I used the liquid hair putty everyday in my son's hair before school, I really didn't care for the smell kinda weird. The liquid putty was a little messy and drips off hand if use too much of it. It styled pretty good though and stayed in hair for a couple hours before hair fell flat again. Overall I liked it and will be buying it. Rated 4 out of 5 by Its2rats from Really Great product! The Matte and Messy Liquid Hair Putty for Men is a great hair product! It tames the unmanageable hairs and keeps my hair in the desired style I wear it in. It is a bit thick and looks as if it may not apply on the hair evenly or build up in spots. It does apply on the hair very nicely with no build up in areas from it not spreading out. There is rather strong product smell this Hair Putty has. I would like it to be less of a smell, it can be somewhat overpowering. That is why the 4 stars. Overall this is a nice hair product and keeps my hair looking good and in place! Rated 5 out of 5 by Longer hair Dad from This is exactly what I needed. I am growing my hair a little longer so I am looking for a soft hold. I can't use those stuff glue type products and hair spray is too sticky. This worked well to give me some style but not stiffness. I would recommend it to anyone looking for the same styling type. Rated 5 out of 5 by Ballboyracing from Easy to Use for A Great Hair Style This potty is great especially for a guy like me! I never have time or money to DO my hair but when I got this potty the wife should me how I could have my hair looking great within just minutes. Just squeeze I quarter size amount in my hand, rub my hands together, and comb the product threw my hair until I like it. I can literally wake up 30 minutes late for work and still have time to do my hair its so easy to do. The bottle is easy to open and squeeze the product out, it doesn't leave my hands feeling sticky, it has a lotion consistency, and it smells great. I also really like that it doesn't leave that nasty white stuff in your hair once it dries or even after sleeping on it. This is great for all men especially men who want to look good but don't want to spend a lot of time or money on your hair.